Obtain the ClassicMS installer for Windows from our downloads page. Disable your antivirus during the installation (antiviruses can cause some problems with the installation). Add an exclusion rule to the antivirus to prevent issues with launching the game. Locate ClassicMS.exe, right-click, select "Properties". Then select the "Compatibility" tab and check "Run this program in compatibility mode for:"
Obtain the ClassicMS.dmg file from our downloads page. Open the ClassicMS.dmg file from your Downloads location. Drag ClassicMS to your Applications folder. ClassicMS should be listed under your Launchpad. Obtain the ClassicMS installation bundle for Linux from our downloads page. Open a terminal emulator window. Set Windows Version to "Windows 98"
cd into the directory where you have your extracted ClassicMS installation and run the bash command to start your game. 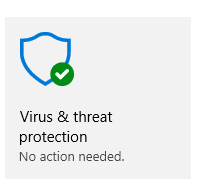 These instructions are written for the built-in Windows Defender in Windows 10. Then locate "Virus & threat protection"
Choose "Virus & threat protection settings"
Choose the Folder where ClassicMS is installed. Vote for ClassicMS on our voting page.